April Fool’s Day might be over, but this juvenile toy will definitely elicit a fair number of laughs at the office! 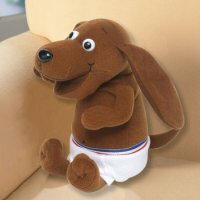 Tucked into his tighty-whities, this plush dachshund has a surprise for you when you press his paw! Wiggling his head and arms side to side, he moves his mouth to flatulent phrases including a familiar tune “tooted” a whole new hilarious way! Fun for little ones and goofy grown-ups! The Pooting Tooting Frank Farter Dog would make for the perfect gag gift, retailing for $14.98 a pop.